Kaspersky PURE 3.0 Total Security is Kaspersky’s flagship do-it-all security software for your PC, family and home network. Kaspersky PURE uses the same security technology as Kaspersky Internet Security and delivers the ultimate PC protection for your home, combining every security component you can imagine –optimized for maximum PC performance– to ensure the security of your PCs, identity, passwords, photos, to protect your children when they are online, and much more besides. Plus, Kaspersky PURE 3.0 is simple to use, allowing you to easily manage the security of every PC in your home from a single PC. Kaspersky PURE 3.0 protects your computer against known and unknown threats, network and intruder attacks, spam and other unwanted data. Each type of threat is processed by a separate application component. This structure of the protection system allows a flexible configuration of the application, depending on the needs of any specific, or of an enterprise as a whole. With special features that add further layers of protection when you’re online shopping or banking, Kaspersky PURE 3.0 also secures your money and your accounts against cybercriminals. Kaspersky PURE 3.0 also lets you control user access to the computer and the Internet, back up data, and create encrypted containers for confidential information, and manage computer security on the home network from the administrator workstation. Kaspersky PURE 3.0 automatically updates itself with greater efficiency, neither getting in your way nor taking up computer resources. In one word, Kaspersky PURE Total Security ensures your total peace of mind while surfing the Internet: your digital life is safe, your PC is in tip-top condition, your most valuable information is secure and your family is protected. Kaspersky PURE 3.0 Total Security is priced at $44.95 for one year Activation Code / License Key on 3 PCs. Before purchasing, interested users can download the trial version to test the software to see if it is worth buying. Like other security software, the official Kaspersky website usually provides free trial for one month only, but there is a promotion offer to get a free trial copy of Kaspersky PURE 3.0 Total Securitythat protect you for 2 months (India Only). Get it now and Think Later. This offer wont last long! You are entitled to download the Kaspersky Pure 3.0 Total Security from www.kaspersky.com/pure-latest-versions. Please note that If you already have trial version of Kaspersky Pure 3.0 Total Security version installed in your PC then current Activation code cannot be used on the existing trial version. During installation, click on ‘Activate commercial version’ and enter the activation code you received to activate the product. 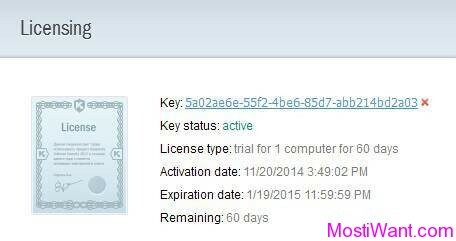 DO NOT click “Activate Trial Version” (If you select “Activate Trial Version”, you will only receive a 30-day trial and you will not be able to activate the 6-month fully functiona license). Activation codes will only be valid for 30 days from date of issue. Not sure if Kaspersky will blacklist giveaway keys for users from other countries or not. So better use an India IP to active your license!